Pages are added to this category by Template:Structurae. Pages in category "Structurae ID same as Wikidata"
The following 200 pages are in this category, out of approximately 1,434 total. This list may not reflect recent changes (learn more). The A6 motorway is a motorway in Croatia spanning 80.2 kilometres. It connects the capital, via the A1. The motorway forms a major transportation corridor in Croatia and is a part of European route E65 Nagykanizsa–Zagreb–Rijeka–Zadar–Split–Dubrovnik–Podgorica. The A6 motorway route follows Pan-European corridor Vb, the A6 motorway runs near a number of Croatian cities, provides access to Risnjak National Park and indirectly to numerous resorts, notably in the Istria and Kvarner Gulf regions. The motorway route was completed in 2008, the motorway is nationally significant because of its positive economic impact on the cities and towns it connects, and because of its contribution to tourism in Croatia. The importance of the motorway as a route will be further increased upon completion of a proposed expansion of the Port of Rijeka and Rijeka transport node. The motorway consists of two lanes and an emergency lane in each driving direction separated by a central reservation. Sections of the motorway that have a gradient greater than 4% are divided into three lanes to prevent traffic problems caused by slower vehicles and these sections have no emergency lanes. Similarly, there are no emergency lanes in the tunnels, all intersections of the A6 motorway are grade separated. As the route traverses rugged mountains it requires numerous long bridges, tunnels, as of 2010 there are nine exits and three rest areas situated along the route. The majority of the motorway is a ticket system toll road with pricing tied to vehicle classification, each exit between Grobnik mainline toll plaza and Bosiljevo 2 interchage has a toll plaza. No toll is charged at Bosiljevo 2 where the switches to the A1 motorway. Exits between the toll plaza and Orehovica interchange have no toll plazas, as that part of the A6 route is not tolled. A motorway connecting Zagreb and Rijeka was originally designed in the early 1970s, the first section, between Rijeka and Kikovica, opened on September 9,1972, and a Zagreb–Karlovac section followed on December 29,1972. Those sections were the first modern motorways to be built in Croatia and Yugoslavia, due to political upheavals in Croatia and Yugoslavia, construction of the motorway was labeled a nationalist project and, along with the proposed Zagreb–Split motorway, was cancelled in 1971. The Royal Alexandra Interprovincial Bridge is a steel truss cantilever bridge spanning the Ottawa River between Ottawa and Gatineau, Quebec. It is known locally as both the Alexandra Bridge and the Interprovincial Bridge, the bridge was constructed by the Canadian Pacific Railway between 1898 and 1900. Four barges were built to move steel beams into position, during the winter workmen toiled day and night chopping channels to keep the ice clear for the barges to pass so that work could continue on the superstructure. Considerable construction delays were caused by the winter conditions. By September 1900 the four fixed spans were complete. The Canadian Society of Civil Engineers held its meeting in Ottawa in order that its members might tour the bridge works. The bridges main cantilever span was, at the time of construction, the longest in Canada. Both records are now held by the Quebec Bridge, the centre span was successfully put in place on October 7, and a locomotive made a trial run on December 12,1900. On February 18,1901 the bridge was inaugurated as the Interprovincial Bridge as it had been built by the Ottawa Interprovincial Bridge Company. The name was changed in September 1901 to the Royal Alexandra Bridge in honour of the new Queen during the visit of her son, the Royal Alexandra Interprovincial Bridge crosses the Ottawa River just east of Parliament Hill at Nepean Point in Ottawa. The bridge was designed primarily to carry CPR trains but had a track for local electric service between Ottawa and Hull, as well as a lane for carriage traffic. During the late 1950s the bridge was upgraded to carry vehicular, on August 21,1989, the bridge was the site of a noted murder. Alain Brosseau, a waiter at the Château Laurier, was walking home to his apartment in Hull after finishing his shift at 11,30 pm, on his way he passed through Majors Hill Park. The park was known as a popular gay pick-up area, and six youths were in the searching for homosexuals to rob. They saw Brosseau and followed him when he walked to the bridge, a short way across Brosseau was first hit with a stick and robbed. The Aesepus Bridge was a late antique Roman bridge over the Aesepus river in the ancient region of Mysia in modern-day Turkey. It is notable for its advanced hollow chamber system which has employed in other Roman bridges in the region. In a field examination carried out in the early 20th century, the four main vaults of the bridge were found in ruins, while nearly all piers and the seven minor arches had still remained intact. Today, the two remaining pier stubs in the riverbed are still extant, while the condition of the rest of the structure is difficult to determine, the Aesepus Bridge is located in northwestern Turkey,8 km north of Sariköy as the crow flies, approximately 5. The earliest investigation on the Aesepus Bridge was published by the British archaeologist Hasluck in 1906, in his view, only the pier foundations and the abutments with their minor arches are unequivocally of Roman origin. The exposed upper part of the piers showed four parallel, slot-like hollow spaces running through the length of the structure. 4 World Trade Center is a skyscraper that is part of the new World Trade Center complex in New York City. It opened to tenants and the public on November 13,2013 and it is located on the southeast corner of the 16-acre World Trade Center site, where the original nine-story 4 World Trade Center stood. Pritzker Prize-winning architect Fumihiko Maki was awarded the contract to design the 978-foot-tall building, the total floor space of the building includes 1.8 million square feet of office and retail space. The buildings groundbreaking took place in January 2008, the original 4 World Trade Center was a 9-story low-rise office building completed in 1975 that was 118 ft tall and in the southeast corner of the site, in Lower Manhattan, New York City. The buildings major tenants were Deutsche Bank and the New York Board of Trade, the building reached street level in November 2009. The safety cocoon was installed December 2010, the first glass was installed May 2011. 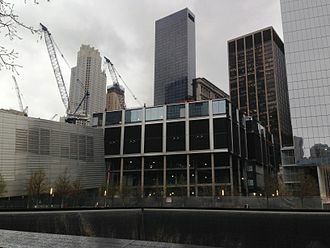 In November 2010, three PureCell fuel cells were delivered at the World Trade Center site which together provide about 30% of the tower’s power. The structural engineer for the building is Leslie E. Robertson Associates, on February 16,2012, one of the buildings construction crane cables snapped while lifting steel, causing the steel to fall 40 stories from the building, landing on a flat bed truck. Construction on the building resumed after the accident. On June 25,2012, steel topped out at floor 72, structural steel and concrete completed by June 1,2013, followed rapidly by the removal of construction fencing in September 2013 and the buildings opening in November 13,2013. Cost of construction of 4 World Trade Center was 1.67 billion USD, funded by insurance funds, the first tenants to move in were two government agencies, and as of July 2015, the building is 62% leased. The above-ground portion of the building dedicated for use, will accommodate offices using two distinct floor shapes. From floors 7 through 46, the floor space is 36,350 square feet in the shape of a parallelogram. The tower includes five levels of mechanical floors, the New York Power Authority selected UTC Power to provide 12 PureCell Model 400 fuel cells that will be used to provide electricity and heat. 555 Mission Street is a 33 story,147 m office tower in the South of Market area of San Francisco, California. Construction of the began in 2006 and the tower was finished on September 18,2008. It is the tallest office building constructed in San Francisco since the 1980s, the tower was originally approved by the Planning Commission on April 5,2001 to rise 137.5 m and 30 stories. A revised plan, adding three stories and raising the height to 147 m, was approved on December 13,2001, due to the downturn in the office market after the dot-com bust, developer Tishman Speyer froze the project waiting for economic conditions to improve. In 2006, five years after the building was approved for construction, in January 2008, Tishman Speyer signed DLA Piper to occupy 82,000 sq ft floors 22 to 26 of the tower. In March 2008, law firm Gibson, Dunn & Crutcher agreed to take up 60,000 sq ft of space in the tower. In October 2009, Intellectual Property law firm Novak Druce + Quigg moved into the 34th floor penthouse of the building, as of summer 2008, close to half of the buildings office space has been leased, with the possibility of more tenants moving in. In 2010, Deloitte signed a 15-year lease to occupy 10 floors of the building, becoming the anchor tenant, in June 2012, Tishman Speyer sold the building to Union Investment for US$446.5 million. 555 Mission Street is 147 m with 33 above ground office floors on a 34,293 square feet located on Mission Street. There are two basement levels containing 180 parking spaces in a parking garage. The entire building is split into three zones, which are referred to as Low Rise, Mid Rise, and High Rise, the Low Rise section contains a 20,700 square feet -floorplate and the Mid Rise section contains a 18,000 square feet -floorplate. The highest region, the High Rise, contains a 16,000 square feet -floorplate, the building does not have a floor numbered thirteen. The floor to ceiling height of the building is 9 feet, to support the office tower,555 Mission has a steel frame structure. The metal decks and concrete will support the office floors, enclosing the steel structure is a glass curtain wall that has protruding glass and metal accent fins. The Ada Covered Bridge is a 125-foot span Brown truss covered bridge erected in 1867 in Ada, United States. Carrying Bronson Street across the Thornapple River, it is located just south of where the Thornapple enters the Grand River and it is listed on the National Register of Historic Places. The bridge uses the Brown truss system, consisting of diagonal compression beams and almost vertical tension members was patented by Josiah Brown of Buffalo, a timber bearing Browns name was discovered during repair work carried out in 1913. The bridge is 125 feet long, and originally rested on wooden pilings, as is typical for covered bridges, its gabled roof is covered with creosote shingles. The Michigan State Legislature authorised Ada Township to borrow up to $3,000 for building or maintaining bridges in the area, construction of this bridge, known as the Bradfield Bridge was carried out in 1867 by William Holmes. Prior to construction of the dam, the Thornapple River was prone to flooding. According to a historical marker posted at the bridge, it is said that used to drive wagons loaded with stones onto the bridge during high water to hold it to the foundation. Repair work was carried out in 1913 to modify the trusses, the bridge was part of an important artery into the village of Ada until 1930, when the main highway was rerouted and a concrete bridge built further down the Thornapple River. At that time the bridge was closed to traffic, reverting to pedestrian use only. The Road Commission purchased a barn to supply wood for replacement of badly deteriorated elements. The bridge was listed with the Michigan State Register on May 9,1969 and it was awarded a Michigan Historical Marker on August 28,1974. It is one of four existing publicly owned covered bridges in Michigan, in 1979 the roof collapsed due to heavy snow, and the bridge was restored using funds raised by private donations. Shortly after the repairs were finished, the bridge was destroyed by fire. The citizens again rallied, this time with the help of the Amway corporation, headquartered in Ada, the replica bridge, now resting on concrete abutments, is 14 feet wide and 125 feet long. The bridge is now only to pedestrian traffic and connects the Village of Ada on one side of the Thornapple River with a park on the other side. The Alfred H. Smith Memorial Bridge is a railroad bridge spanning the Hudson River at Castleton-on-Hudson and Selkirk, New York in the United States. The bridge forms part of the Castleton Subdivision of CSX and he died in a horse-riding accident in Central Park in 1924, prior to the completion of the bridge in that same year. He is sometimes confused with Alfred E. Smith, New Yorks governor at the time, the bridge has been the southernmost rail freight route across the Hudson River since 1974, after a fire damaged the Poughkeepsie Bridge,55 miles further south. Rail freight traveling between New York City or Long Island and all points south must take a 280-mile detour along the Hudson River and across the bridge, a route known as the Selkirk hurdle. The Cross-Harbor Rail Tunnel project has proposed as a direct route between Long Island and the US mainland, cutting across New York Harbor. The Alfred H. Smith Memorial Bridge was completed in 1924 to facilitate rail traffic which was growing increasingly bottlenecked through Albany. 85 Sky Tower, formerly known as the T & C Tower or Tuntex Sky Tower, is an 85-story skyscraper located in Lingya District, Taiwan. The structure is 347.5 m high, an antenna increases the pinnacle height to 378 m. Constructed from 1994 to 1997, it is the tallest skyscraper in Kaohsiung, there is no 44th floor in the building, the 43rd floor connects directly to the 45th floor. The pyramid shaped crown is the equivalent of 3 stories high, there is no elevator access to floors above 80. The columns and foundation are made of steel since at 85th storey the 21MPa Ultimate compressive strength of concrete collapses, the building was designed by C. Y. Lee & Partners and Hellmuth, Obata & Kassabaum, and has an unusual design with two separate 39-floor sections, which merge into a single central tower rising to a spire. This unique design leaves a space below the central part of the tower. The design was inspired by the first Kanji and Chinese character of the citys name, john W. Milton was Project Director on behalf of Turner International Inc, a subsidiary of Turner Construction. 101 Federal Street is a skyscraper on Federal Street in the Financial District neighborhood of Boston, Massachusetts. 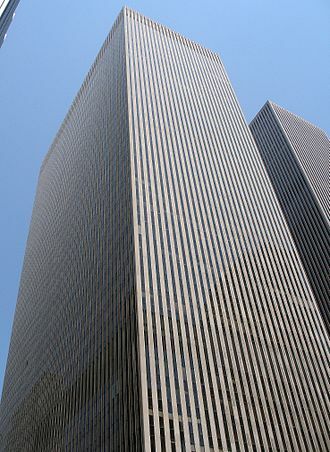 Completed in 1988, the 116 meter building was designed by Kohn Pedersen Fox Associates PC, the building is known as 75–101 Federal Street These buildings contain 800,000 sq ft of office space. The State Street Trust Building is the 75 Federal Street portion of the building, the Art Deco building was designed by Thomas M. James in 1929. In the late 1980s, the Boston Redevelopment Authority allowed for the elimination of smaller narrow streets to create larger building parcels and this is how an L-shaped parcel was created to make room for 101 Federal Street. 101 Federal is three crenellated shafts joined to 75 Federal Street on the first eleven floors, the limestone facade takes into account the coloring of the older 75 Federal St. The exterior surfaces of the 21-story building at 75 Federal consists of low relief figurative, the exterior features bronze panel sculptures depicting finance and sculpture, agriculture and transportation. The 26-floor building was designed to consolidate numerous smaller buildings and outdated offices into a modern headquarters for The Pacific Telephone & Telegraph Co. The building was the first high-rise south of Market Street, and along with the Russ Building, AT&T sold the building in 2007, and as of 2013, Internet company Yelp is the main tenant. At the time of its construction, it housed The Pacific Telephone & Telegraph Co. a member of the Bell System, the building once had a bell motif in many places on its façade, most notably surrounding the arch over the main entrance doors on New Montgomery Street. After the breakup of the Bell System in 1984 and the formation the regional so-called Baby Bell companies, statues of eight eagles perch atop the towers crown. The building has an L-shaped floor plan, and the architecture decoratively incorporates spotlights to show the exteriors terra cotta ornamentation day, in 1929, Winston Churchill visited the building and made one of the first transatlantic telephone calls. The tower in August 2018. Looking up at 101 California, highlighting the faceted cylindrical structure. Foreground: Alfred H. Smith Bridge; Background: Castleton Bridge. Seen from the west shore, south of the bridges. 44 Montgomery Street (left), overshadowing the neighboring Hobart Building. Taken from Main and Howard.